Pumpkin is all the rage this fall. Everywhere I look, pumpkin is incorporated into desserts, drinks, dips, soups, etc. That said, I'm joining in the pumpkin love fest and baking with it! 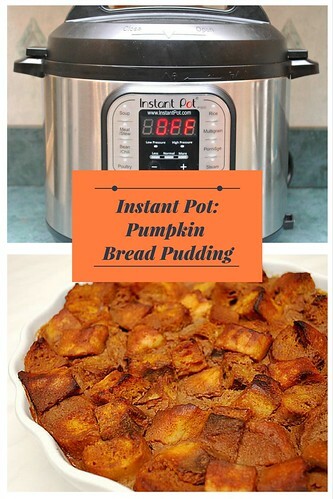 There's something comforting about bread pudding to me, which I've explained here... so I took this opportunity to use pumpkin in making this Instant Pot Pumpkin Bread Pudding recipe. The combination of pumpkin and cinnamon captures the flavors of fall with every bite, perfect for this time of year. What I liked about this recipe is the ease in putting it together. Just the aroma of all the ingredients makes me anxious for the leaves to start turning color. And if the pumpkin bread pudding wasn't enough, the rich, buttery caramel sauce made with dark brown sugar puts this over the top! Place the trivet into the bottom of IP and add 1 cup of water. In a large bowl, whisk half and half, pumpkin, dark brown sugar, eggs, pumpkin pie spice, cinnamon and vanilla extract to blend. Fold in bread cubes. Transfer mixture to a 3 cup baking dish. Let stand 15 minutes. Place dish on top of trivet inside the IP. Meanwhile, prepare the caramel sauce (recipe below) and preheat broiler. 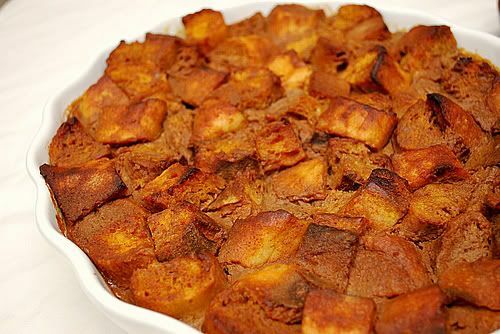 Remove bread pudding from IP and transfer to a baking sheet. Place under broiler to brown the top until desired toasted color is achieved. Serve warm with caramel sauce (recipe follows below) and sift powdered sugar over bread pudding if desired.